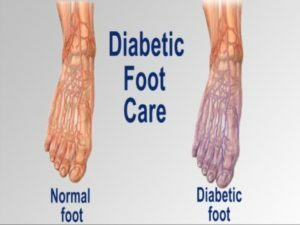 Foot care is often ignored when it comes to diabetic care in India. There is a large lack of awareness for diabetes in India, and the amount of people diagnosed with the disease is increasing. Doctors in India are trying to raise diabetic foot care awareness in particular. Foot complications resulting from diabetes may cause people to need to amputate their feet or other limbs. Diabetics must pay special attention to their feet to help prevent any complications. If you believe you are having problems with your diabetic feet, consult with one of our podiatrists from Foot HealthCare Associates. Our doctors will attend to all of your foot and ankle needs. Diabetes affects millions of people every year, so it is important to be aware of foot care. Diabetes can damage blood vessels in many parts of the body, including the feet. Because of this, taking care of your feet is essential if you have diabetes, and having a podiatrist help monitor your foot health is highly recommended. If you have any questions, please feel free to contact one of our offices located in Michigan. We offer the latest in diagnostic and treatment technologies to meet all your needs.